Many Americans have a remarkably unrefined taste in salads; my brother has long counted himself in this group. Dice up some crunchy Iceberg type lettuce, splash on a dollop of ranch dressing, maybe chop a leaf of romaine up if you’re feeling frisky and call it a salad, this is the way we’ve been trained to eat. I’m here, a voice in the supermarket produce aisle wilderness calling, to tell you it’s time to open up your palate, look beyond lettuce, live a little, and add some spice to your life and salad bowl with three of my favorite easy to grow leafy greens: Mizuna, Frilly Mustard, and Italian Dandelion. 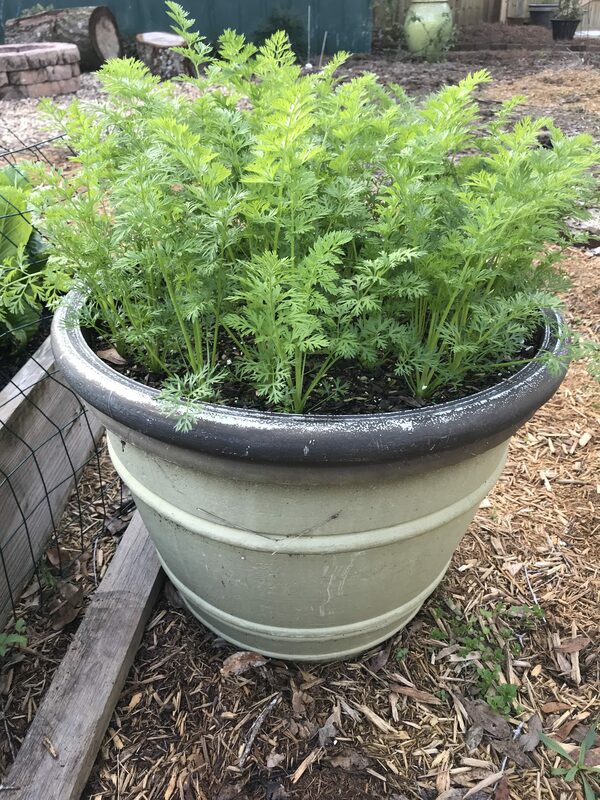 Mature Mizuna plants in the author’s container garden. ‘Scarlet Frills’ Mustard in the author’s container garden. raised beds or containers. I love plants that do heavy lifting as both eye-catching ornamentals and delicious edibles! Mizuna is a little known member of the mustard family that is quickly becoming one of my favorite leafy greens! 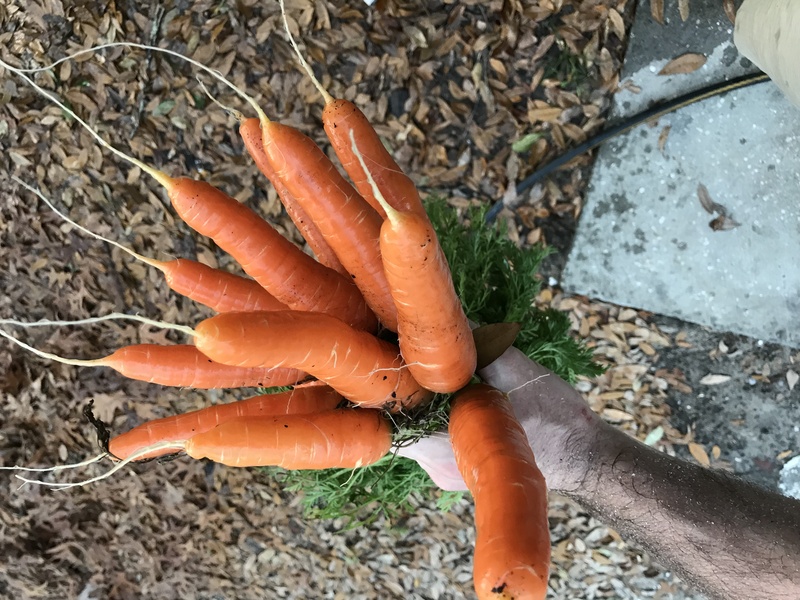 It faces no major pest or disease problems in the garden and it is extremely tolerant of the cold weather Floridians periodically face through the winter, laughing off frost. Mizuna possesses lovely, deeply cut, pale green, fringy leaves complete with crispy white stems, all of which are edible – no need to separate stems when processing to eat! This lovely little Asian green has a mild peppery taste (think a toned-down Arugula) and adds perfect flavor and texture to any salad! 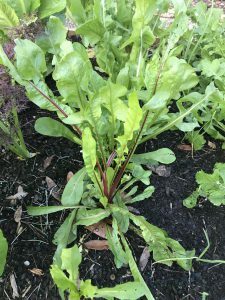 Many Southerners are well acquainted with traditional Mustard greens and their preparation (more than a little bacon and salt) but may not be aware of newer Mustard cultivars that give the species a bit of refinement and make it a salad celebrity! 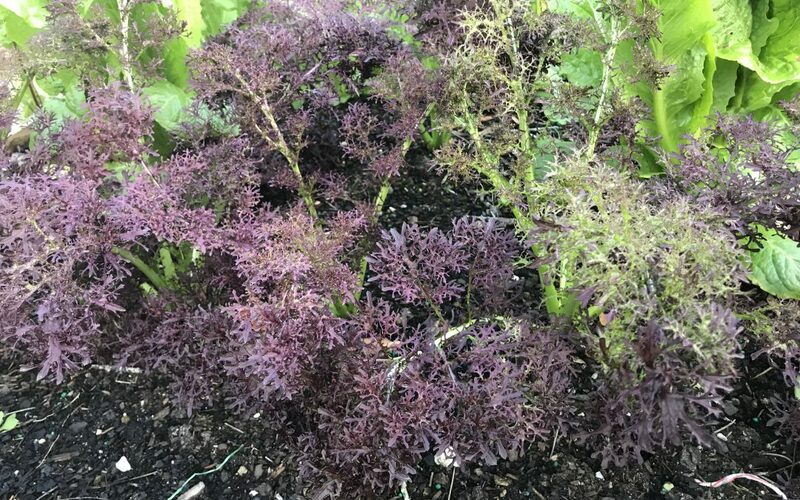 This winter, I’m growing a cultivar of Mustard called ‘Scarlet Frills’ (aptly named with finely serrated burgundy-red leaves) and really enjoy its peppery horseradish taste as a foil to the mildly sweet taste of traditional salad greens like lettuce and spinach. Mustards are extremely cold tolerant and slow to bolt, making it a mainstay in the salad garden all winter long; you really get your money’s worth from a few Mustard plants! However, even if this leafy green wasn’t delicious, it would be worth growing. 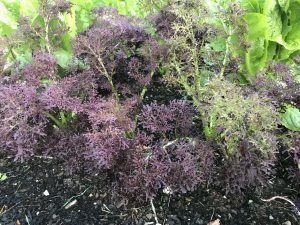 The “fancier” Mustard cultivars are highly ornamental and deserve a spot in any cool season container garden. ‘Italiko Red’ Italian Dandelion in the author’s container garden. Finally, the one that turns up the most noses when I mention growing and eating it, Italian Dandelion (Cichorium intybus)! I’m not advocating foraging in your turfgrass to find dinner, in fact, Italian Dandelion is not a true dandelion (it’s actually a chicory). However, it does share a number of features with its weedy cousin, including leaves that are similar in appearance and a vigorous taproot. That’s where the comparisons stop though, as Italian dandelion is a superior garden plant, more upright growing, much larger, and deeper green (some varieties including the one I grow ‘Italiko Red’ have red veined leaves) than its wild cousin. Unlike Mizuna and some of the milder mustards, Italian Dandelion is a bit of an acquired taste. 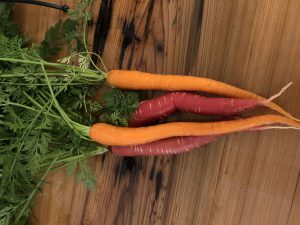 It imparts a strong bitter flavor that may be cut with milder greens in a salad or cooked down to reduce bitterness. Either way you try it, put Italian Dandelion on your cool season garden next year! Mizuna, Frilly Mustard, and Italian Dandelion all require similar growing conditions. In Florida, leafy greens are cool season vegetables, growing through the fall, winter and spring months. Seeds should be sown in late September and can be stagger-sown (plantings every couple of weeks) to ensure a steady supply through spring. As a rule, they prefer rich, well-drained soil high in organic matter. 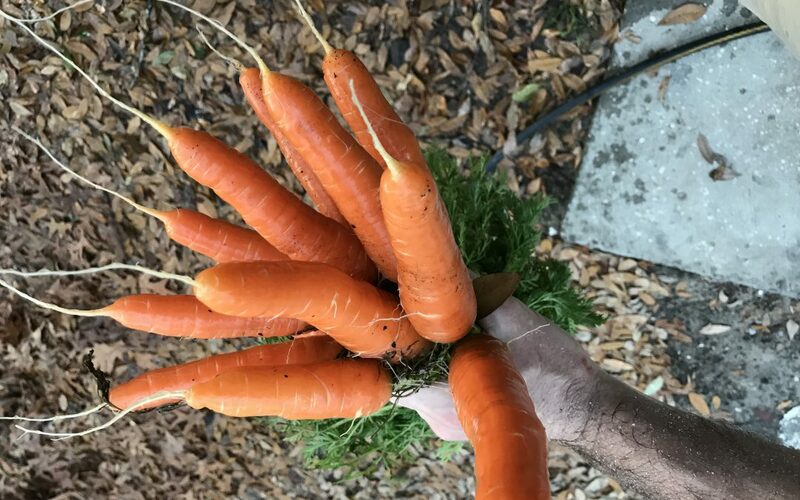 These soil conditions are achievable with either quality commercial potting mixes or homemade concoctions of compost and pine bark. 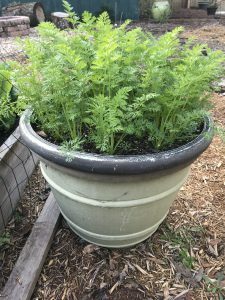 The beds or containers you fill with the aforementioned soil should be sited near a good water source (plants that aren’t convenient to water get neglected, trust me) in an area that gets 6-8 hours of full sunlight. I like to topdress at planting (if using transplants) or after germination (if using seed) with a good general purpose, slow-release fertilizer, many formulations and brands that work are widely available for purchase. 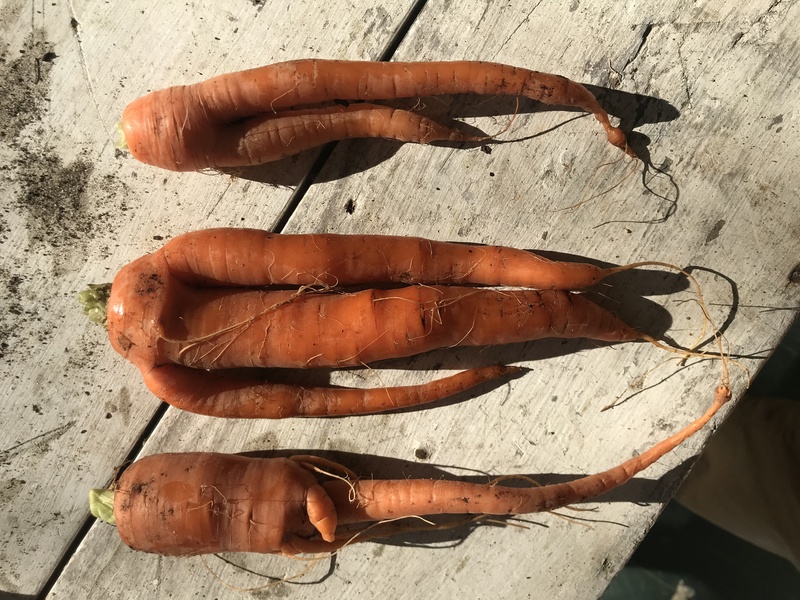 Finally, be sure to purchase seed from a quality source. 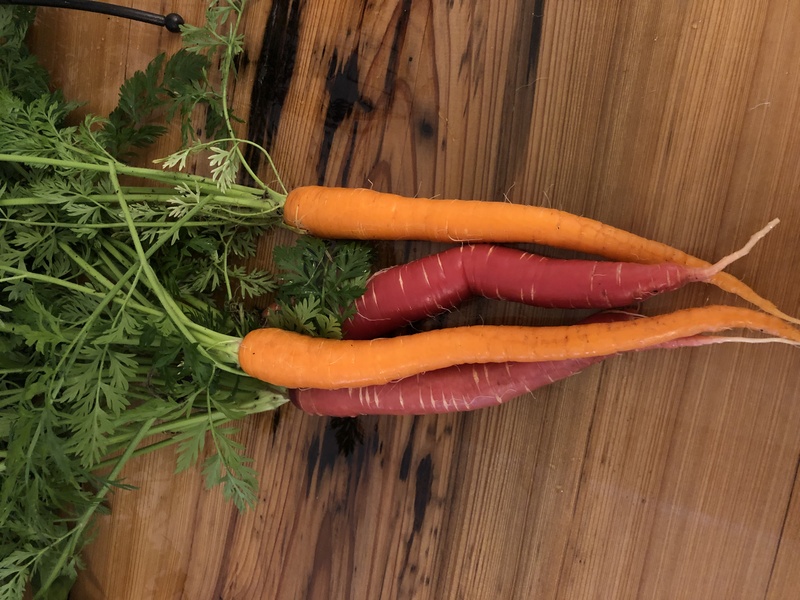 Online purveyors Johnny’s Selected Seeds, Baker Creek Heirloom Seeds, and Sow True Seeds are good places to start, though the options are nearly endless! 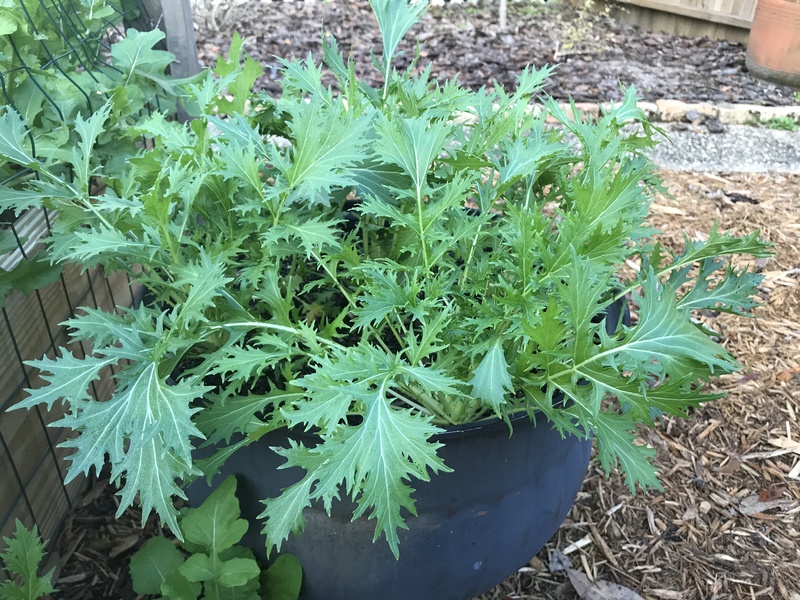 Next year, when planning your cool season garden, remember to add a little spice with these three leafy greens, Mizuna, Frilly Mustard, and Italian Dandelion! 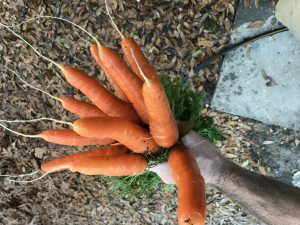 For more information about cool season gardening and other topics, consult your local UF/IFAS Extension Office. After a devastating windstorm, as we just experienced in the Panhandle with Hurricane Michael, people have a tendency to become unenamored with landscape trees. 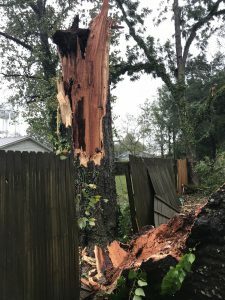 It is easy to see why when homes are halved by massive, broken pine trees; pecan trunks have split and splayed, covering entire lawns; wide-spreading elms were entirely uprooted, leaving a crater in the yard. However, in these times, I would caution you not to rush to judgement, cut and remove all trees from your landscape. On the contrary, I’d encourage you, once the cleanup is over and damaged trees rehabilitated or disposed of, to get out and replant your landscape with quality, wind-resistant trees. First, it’s helpful to take a step back and remember why we plant and enjoy trees and the important role they play in our lives. Beyond the commercial aspect of farmed timber, there are many reasons to be judicious with the chainsaw in the landscape and to plant anew where seemingly sturdy trees once stood. For example, trees provide enormous service to homes and landscapes, from massive cooling effects to aesthetic appeal. 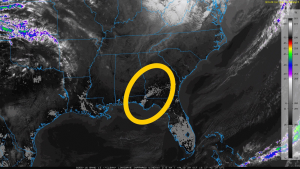 Take this thermal satellite image of Hurricane Michael’s path that simultaneously shows the devastation of a major hurricane and the role trees play in the environment. Lightly shaded area showing higher ground temperatures from loss of vegetation. In the lighter colored areas where the wind was strongest and catastrophic tree damage occurred, the ground temperatures are much higher than the unaffected areas. Lack of plant life is entirely to blame. Plants, especially trees, provide enormous shading effects on the ground that moderate ground temperatures and the process of transpiration releases water vapor, cooling the ambient air. Trees also lend natural beauty to neighborhood settings. 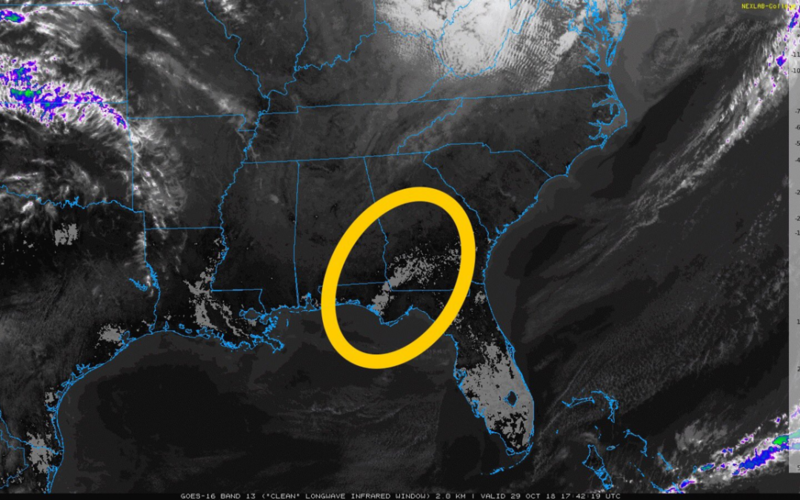 There is a reason people termed the hardest hit areas by Michael “hellscapes”, “warzones”, etc. Those descriptions imply a lack of vegetation due to harsh conditions. In this respect, trees soften the landscape with their foliage colors and textures, create architecture with their height and shape, and screen people from noise, unpleasant sights and harsh heat. Though all trees give us the benefits outlined above, research conducted by the University of Florida over a span of ten major hurricanes, from Andrew to Katrina, shows that some trees are far more resistant to wind than others and fare much better in hurricanes. 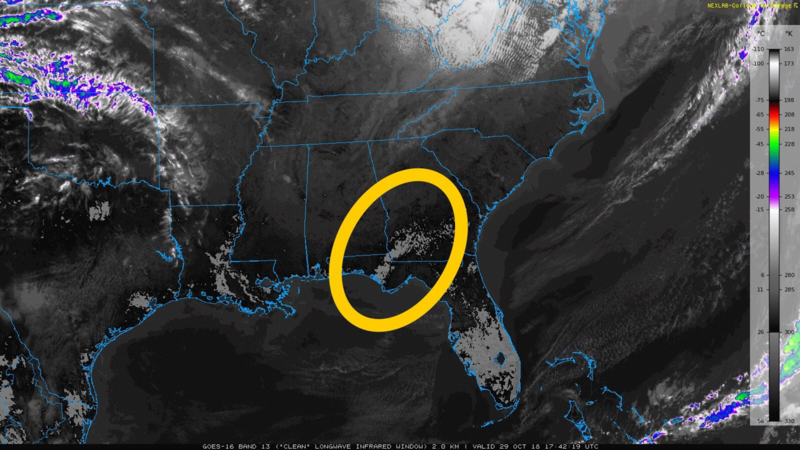 In North Florida, the trees that most consistently survived hurricanes with the least amount of structural damage were Live Oaks, Cypresses, Crape Myrtle, American Holly, Southern Magnolia, Red Maple, Black Gum, Sycamore, Cabbage Palm and a smattering of small landscape trees like Dogwood, Fringe Tree, Persimmons, and Vitex. If one thinks about these trees’ growth habits, broad resistance to disease/decay, and native range, that they are storm survivors comes as no surprise. Consider Live Oak. This species originated along the coastal plain of the Southeastern United States and have endured hurricanes here for several millennia. Possessing unusually strong wood, they have also developed the ability to shed the majority of their leaves at the onset of storms. This defense mechanism leaves a bare appearance in the aftermath but allows the tree to mostly avoid the “umbrella” effect other wide crowned trees experience during storms and retain the ability to bounce back quickly. Consider another resistant species, Bald Cypress. In addition to having a strong, straight trunk and dense root system, the leaves of Bald Cypress are fine and featherlike. This leaf structure prevents wind from catching in the crown. Each of the other listed species possess similar unique features that allow them to survive hurricanes and recover much more quickly than other, less adapted species. Laurel Oak split from weak branching structure. However, many widely grown native trees and exotic species simply do not hold up well in tropical cyclones and other wind events. Pine species, despite being native to the Coastal South, are very susceptible to storm damage. The combination of high winds and beating rains loosens the soil around roots, adds tremendous water weight to the crown high off the ground, and puts the long, slender trunks under immense pressure. That combination proves deadly during a major hurricane as trees either uproot or break at weak points along the trunk. In addition to pines, other widely grown native species (such as Pecan, Laurel Oak and Water Oak) and exotic species (such as Chinese Elm) perform poorly in storms. Just as the trees that survive storms well possess similar features, so do these poor performers. We’ve already mentioned why pines and hurricanes don’t mix well. Pecan, Laurel Oak, and Water Oak tend to have weak branch angles and break up structurally in wind events. The broad spreading, heavy canopy of trees like Chinese Elm cause them to uproot and topple over. It would be advisable when replanting the landscape, to steer clear of these species or at least site them a good distance from important structures. For these and other recommendations about how to “hurricane-proof” your landscape, contact your local UF/IFAS Extension Office. Plant a tree today. Florida is known for many things, however sweeping vistas of hillsides covered in the orange, red, and yellow foliage of fall is not one of them. Our long, hot summers and short, cool (not cold) winters, and lack of anything of substance resembling a season in between, precludes the fall color show our neighbors to the north enjoy. Don’t settle for synthetic Halloween decorations or faux painted leaves to add festivity to the autumn landscape design. 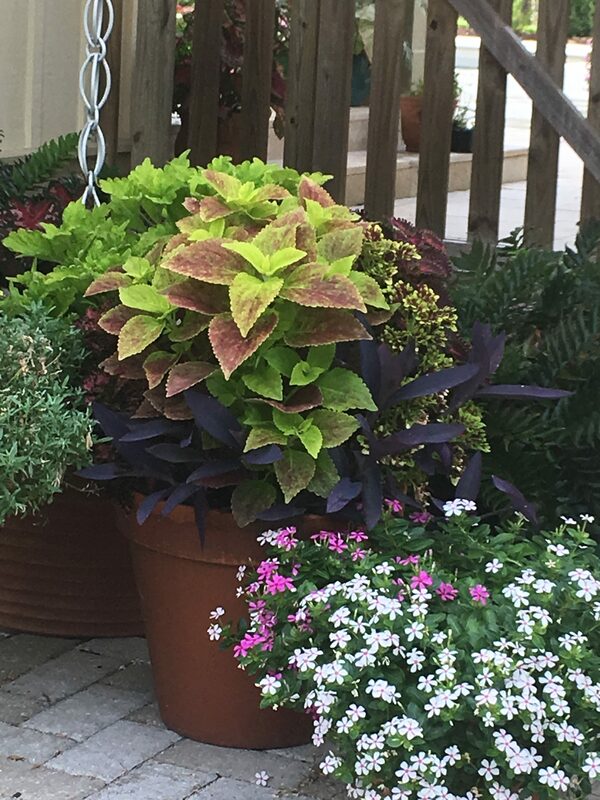 When football season kicks off and summer blooming annuals begin to fade, it’s time to reach into the horticultural toolbox and pull out a couple fall-y Florida Friendly annual foliage species, perfect for the balmy Panhandle “autumn”: ‘Alabama Sunset’ coleus and ‘Petra’ croton. The first plant to consider when looking for outstanding heat tolerant foliage is the common coleus (Solenostemon scuttellarioides), particularly the cultivar ‘Alabama Sunset’. As the name indicates, ‘Alabama Sunset’ offers leaves in shades of red and yellow, perfect for designing fall containers or mixing into planting beds. This popular summer annual is known for its ability to add interesting color and texture to shady areas. Recently with the arrival of the ‘sun coleus’ series (to which ‘Alabama Sunset’ belongs), coleus is permissible in situations with greater sunlight. Coleus is incredibly easy to grow and easy to find since nearly every nursery stocks at least a few cultivars. What’s more, these plants are generally free of pests and disease problems! Even sun coleus does appreciate a little protection from the hot afternoon sun and occasional deadheading of flowers. ‘Petra’ Croton. Photo courtesy Daniel Leonard. The second plant in the fall foliage arsenal is ‘Petra croton’ (Codiaeum variegatum ‘Petra’). 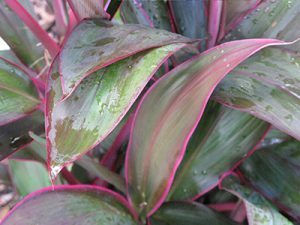 Primarily known as a tropical foliage or indoor houseplant, Petra croton is criminally underused in fall landscape and container design. Petra croton sports bold magnolia-sized leaves striped with colors of yellow, red, orange, and black. 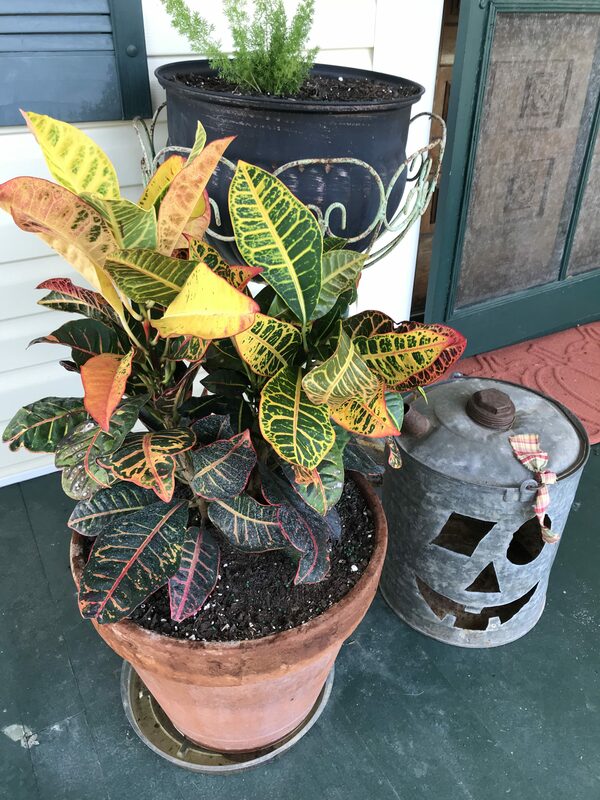 A great Halloween plant to complement those front-porch Jack-O-Lanterns! Like coleus, Petra croton is extremely easy to grow either in a container or in the ground. It should be located in either in full sun or partial shade and watered through establishment. Otherwise, this species is quite drought tolerant and can be killed with kindness if watered too frequently! 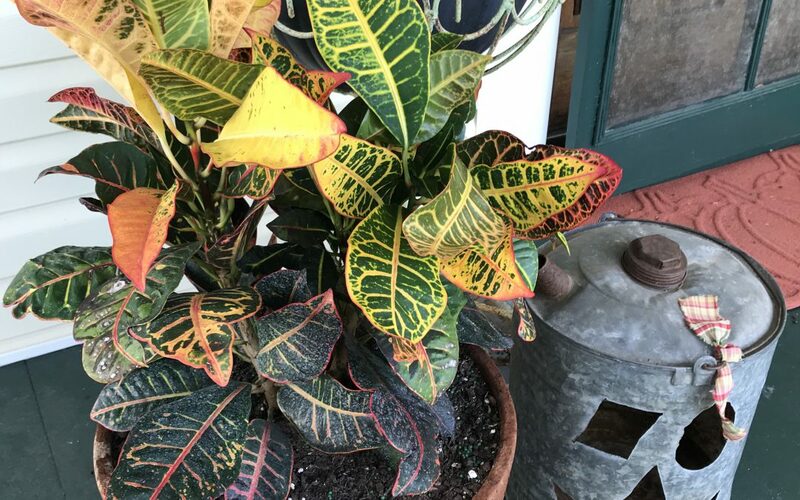 Although croton is a perennial shrub in the tropics, in Northwest Florida it may be killed by frost and best treated as an annual. 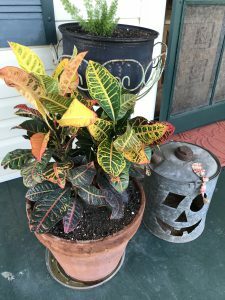 Croton can be expected to reach 30-36” in height in a single season, its size and the boldly colored foliage make it a true focal point in the autumn landscape! Appalachian-grade fall color may be unattainable in the Panhandle in the literal sense, but with these novel plant selections the autumn mood may be present even as the emerald waves hit the sugar white sand. 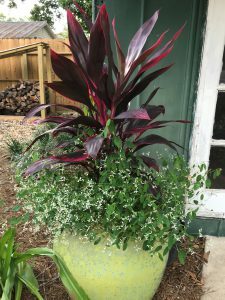 By using annual foliage plants that possess traditional fall colors throughout their life cycle, anyone can add a splash of Autumn to their mixed containers or landscape beds. ‘Alabama Sunset’ coleus and ‘Petra’ croton are the perfect match for this time of year, pairing ease of culture with bold, seasonal color. Plant a couple today! Bring the Color of Hawaii to the Panhandle with Ti Plant! Too often, would be gardeners travel to exotic locales, become intoxicated with the beautiful floral display of Plumeria, Jatropha, Bird of Paradise and Bougainvillea, and come home with visions of homemade leis picked from the garden dancing in their heads. As anyone who has attempted to grow any of the aforementioned plants in the Panhandle will tell you though, fulfilling those visions in the landscape are easier said than done! However, not all is lost for the gardener wanting to bring the tropics home. A tropical feel in the landscape can be achieved, you just have to look beyond the aforementioned flowering plants that will have long since succumbed to winter frost by the time they mature and begin flowering and instead to tropical foliage plants that can be enjoyed for a season and easily (cheaply too!) replaced the following spring. Of all the tropical foliage options available for Panhandle landscapes, my favorite is the Ti Plant, sometimes called Hawaiian Ti. Even if you have never heard of Ti, you have probably seen it. The strap like, 12-18” long, purple and pink striped leaves are hard to miss and add an unmistakable tropical flair in the landscape! Ti Plants grow generally in single, unbranched stalks, though most commercial growers combine several plants into a single pot to give a bushy, multi trunked appearance that looks more appealing on a retail nursery bench. These plants will easily reach 4-6’ in height in a single warm season, providing a powerful punch of pink/purple all summer long. In addition to its considerable attractiveness, Ti boasts a cosmopolitan constitution, as it will grow in sun or shade, outside or inside. Of course, some cultural do’s apply to Ti broadly, regardless of where it is grown, as well as a few don’ts. In general, Ti will be more colorful in brighter light. Though it grows well in shade, its leaves tend to lose their luster and fade to a dull purple in full shade. Similarly, though it will survive in full, all day sun, Ti’s foliage tends to bleach a bit in these conditions and can turn a whitish gray. It is best to shoot for somewhere in the middle for the most vivid foliage color. If growing indoors, give Ti as much light as you can. If growing outdoors, full sun through midafternoon is appropriate, as is bright shade throughout the day. Be sure to give Ti plants consistent moisture, as they will readily wilt down under prolonged drought conditions. As with watering, Ti prefers a consistently fertile soil and will appreciate a topdressing of a complete, slow release fertilizer (made by Osmocote, Harrell’s and others) at planting, with a follow up application 60-90 days later (possibly more frequently depending on temperature and frequency of watering). Though Ti performs well planted in the ground in Northwest Florida as an annual specimen to brighten a border (think of it like a supersized Coleus), it really gets to shine in large, mixed containers. Ti’s upright growth habit and traffic stopping color make it the perfect thriller in the widely used “thriller, filler, spiller” container design. Because Ti can grow quite large relative to other common container plants, a large 20-45 gallon container is necessary to facilitate optimum root growth and plant development. If a smaller container is chosen, water management will become an issue as the Ti plant’s root mass will quickly crowd the container. I prefer glazed ceramic or concrete containers as these are often painted in bright colors that complement Ti’s foliage, do not allow as much air exchange as terra cotta planters (soil in terra cotta containers dry very quickly in hot, dry weather), and are heavy enough that tall Ti plants won’t cause them to blow over in windy conditions. Mix smaller, mounding filler plants and trailing spiller plants under and around Ti in containers. For a striking contrast in color, choose companion plants in white, yellow, orange or chartreuse (remember, plants don’t have to flower to be colorful, vivid foliage plants like coleus or caladium work too!). Regardless of how you use Ti Plant, you’ll find it to be one of the most high value color plants in the landscape. Plant one today and happy gardening!